JYP’s first boy group to debut since 2PM back in 2008 are a hip hop influenced group named GOT7. Unsurprisingly, GOT7 has seven members, two you may recognise as the duo JJ Project, or four members may be recognisable to those who watched Who is Next: WIN in which they competed against YG’s trainees Team A (WINNER) and Team B. Their debut track Girls Girls Girls released on Thursday, showcasing their talents as a group. Already the group are causing a stir, something that has not gone unnoticed by senior label mate Taecyeon of 2PM. On mv release day the rapper tweeted a link to an article called ‘MV release for JYP rookie group ‘GOT7’… looking at the members’ appearance in real life, ‘the best among JYP groups.‘ His response was to joke that they must not have seen 2PM in real life. So is the attention deserved? At almost five and a half minutes long the Girls Girls Girls mv is slightly longer than the track, and than your average mv. Many mvs that clock this length are drama versions, or feature intense narratives, GOT7 use this extended video for different reasons. 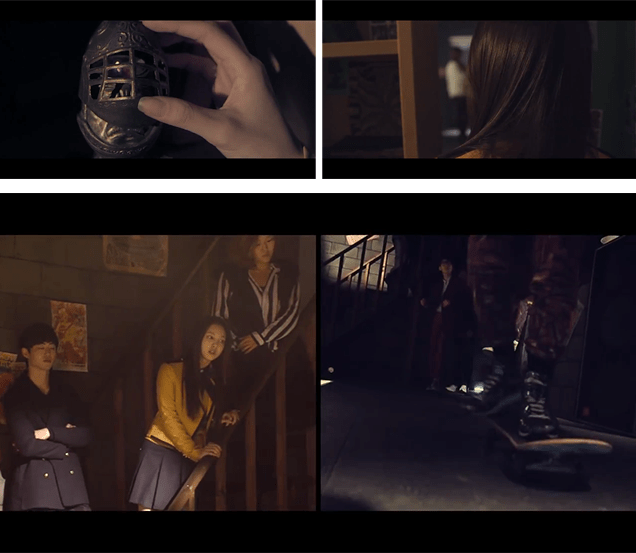 The first minutes and a half of the mv establish a backstory through a condensed narrative. 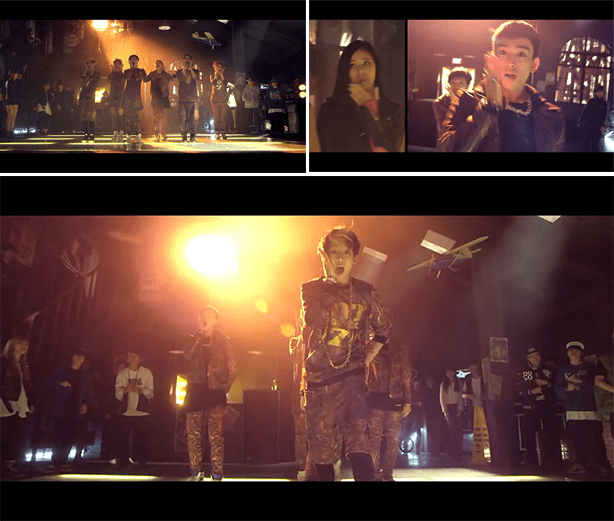 GOT7 are presented as students, though they are the cool, rebellious group at school. Their journey from school sees them ride Wheelman GAS Skateboards, sometimes known as G-Wheels, to their seemingly ordinary location. On the way they pass one of their fellow students, who although initially shocked by their appearance soon becomes curious. Picking up Jackson’s dropped earring she follows them into the building only to find no one is there. Whilst looking around her curiosity peaks upon finding a knights helmet, candlelight glowing inside it. Touching it sparks a little magic, and the bookcase it sits on swings open to reveal a hidden passage to the basement, the place GOT7 and many of their friends spend their free time. Once we hit 1:45 the scene setting narrative dies down to have GOT7 perform their track and choreography on a conveniently placed dance floor. Leaving behind the narrative for the performance allows the new group to show what they can do, unhindered by cuts to a story. Their choreography is complex, at at times the members are doing a collection of different thing, yet the unit look a strong team even during these parts. Fans of acts from JYP may notice that the backing track features Wonder Girls Sohee’s Omona, and this is one of the things that plays an important role in the choreography too. Another prominent point in the choreography is the suggestive elements that draw emphasis to their bodies. The particular one above comes alongside the lyrics ‘(Girls girls girls they love me) / What’s with my body‘. It is suggestive and body emphasising choreography like this that draw focus to meaning of the song. Girls Girls Girls is a rather egotistical song, with lyrics about loving themselves, girls loving them without them having to do anything, and how their bodies attract girls. Though egotistical the lyrics are a very truthful take on idol life, for girls will love GOT7 even when they are doing nothing and their looks certainly aren’t going to hinder that. Adding to their looks is the styling for Girls Girls Girls. Whether you love or hate their brown outfits they are significant to the concept. Even during the narrative we see GOT7 wearing variations of the same outfit, almost like the members are wearing a uniform throughout. Though not identical outfits, rather many styles in the same materials, this presents GOT7 as a strong team, each with their individuality an important element of that team. Take a look at the Girls Girls Girls mv and tell us what you think of the group’s debut release. GOT7’s debut EP Got It? released today, and is available via UK iTunes. 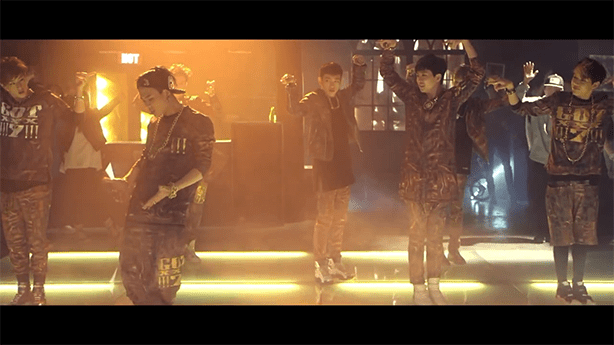 Do you like GOT7’s debut release? 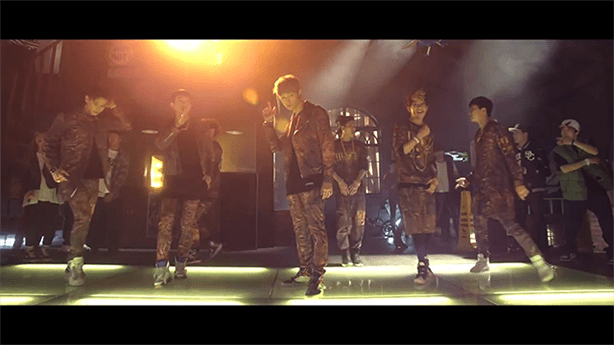 Do they stand out amongst the mass of young male groups and rookies? Have you heard the Got It? EP yet,would you recommend it? Next Article [WOTW] Word Of The Week – It’s Cold!